When a client of ours, let’s call him Joseph, took over a company project, he knew it wouldn’t be easy to turn things around. The design team had fallen behind over the course of a year and a half. They were just six months away from the final delivery date originally committed and had blown through more than half-a-million dollars originally allocated to the entire project. Yet, there was still nothing ready to deliver to their client. There was a huge liability sitting on the table…one that would ruin the company entirely. Joseph knew a special leadership skillset would be needed, the team needed to be realigned, and skills had to be developed. He put in a few extra hours each day, stayed on-call through the night, and worked through weekends. The team was able to secure additional funds from the client, and by reallocating budgets and resources had earned a few more months-worth of extensions. Joseph applied a DISC-based approach to his team-building and optimization strategy. He assessed each team member and paired them up to best complement each other’s strengths and weaknesses. He cut costs by nearly a third by outsourcing offshore teams, and was able to bring the project back on-schedule. In the end, was able to finalize the project in less than five months retained a valued customer for life. Without disclosing the company Joseph worked for, we are all happy to use the resulting product of this specific project today, thanks to the success of his ability to turn around a failing team and lead them all from within. If you don’t find the root cause of a problem, you can’t solve it – it’s as simple as that. Decide whether this is a problem related to communication, the meshing of personalities, or the inability for members to carry out key tasks within a process. Based on the findings, deliver the message to your workforce – and this means communicating with each member of your team, as according to their personality type and contributions, therein. You wouldn’t want anyone to feel left out, and you need to continue motivating each person in their unique DISC language. Positivity will breed an increase in productivity, performance, and collaboration, and then quality will shine. There’s no getting around the fact some people may simply have to be let go. However, you want to keep and improve your workforce as much as possible. Low retention and high turnover are costly for any business, and are counterproductive. Implementing assessments, such as DISC, Behavioral Attitude Indexing (BAI) or 4D-based assessments, you can get to know your workforce and allow you to place them in a way they have best value within the team. You can assess their motivations, find their passions, learn their personality types and tendencies, while predicting their behavior when faced with stress or placed within certain environments. In identifying the problem, you have no choice but to analyze the procedures you are attempting to carry out. Is your workforce even capable of getting the job done? Are you asking too much of their current skillsets? What you can do to overcome limitations is to pair personality types with those that best complement their capabilities and traits. If you have a team member who shows passion for doing research, don’t make this person in charge of negotiations. By assessing the weaknesses and strengths within each member of the team, you can be sure to minimize those tasks in which can be detrimental to progress and position each member for greatness. 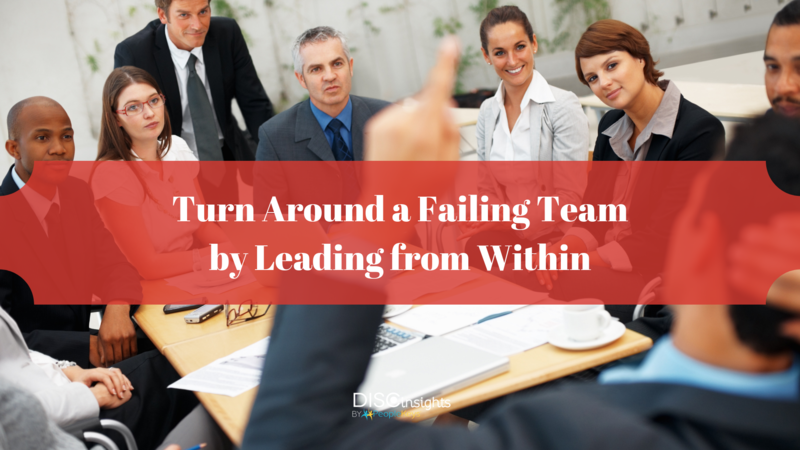 Apply Group Dynamics to reorganize your team. By placing people where they are most effective, you will find your team to be more productive and get through daily workflow much quicker. Processes can be streamlined and less dependencies will occur, therein. Using the results of the personality assessments, you can place people where they are most passionate, where they show the greatest level of skill, and where they might lead others to do the same. Taking charge as a leader, you can delegate through influence and motivate your teams to excel, as opposed to dictating and demanding they do well in whatever they do. MOTIVATE & SUPPORT. CELEBRATE & REPEAT. By motivating your team and celebrating their contributions, you would create a more positive environment in which all can thrive. The quality of work becomes top-notch, and each person feels a sense of accomplishment. By influencing the team, as opposed to dictating, you make them want to do more, give them a sense of accountability, and spark all sorts of emotions which lead them to go above and beyond. Remember, understanding personalities and focusing on positive strengths, while balancing limitations, aids in turning around a failing project or a dysfunctional team. You can create a cycle that only improves as it repeats by leading from within. Learn more about DISC and leadership here.